Get Free Credit Monitoring & Change Alerts. No Credit Card Needed! One of the most important things everyone should keep up with is their credit report and credit score. There are many programs out there that offer these services but it comes with a high monthly cost. Instead of paying those companies a monthly fee, signup for Credit Sesame and get free credit monitoring & change alerts. No credit card needed! When you signup for a free account at Credit Sesame, you’ll receive an analysis of your existing accounts, including credit cards, personal loans, and more. The website will then give you ways to improve your score with unbiased recommendations for new credit cards or loans. The credit monitoring service is provided with information from Experian. Credit Sesame is your one-stop shop for credit reporting and credit monitoring. The website has been featured on numerous website, including The New York Times, The Wall Street Journal, and CNNMoney.com. Users have the ability to check their credit score and report through both the desktop site as well as Android and iOS devices. When signing up for your free credit monitoring & change alerts, your security is the company’s top priority. Credit Sesame only uses bank level encryption to ensure that no confidential information is transferred unprotected. This creates a worry and stress-free environment where you can safely view customized reports for your credit score. It’s time to get your credit in order. 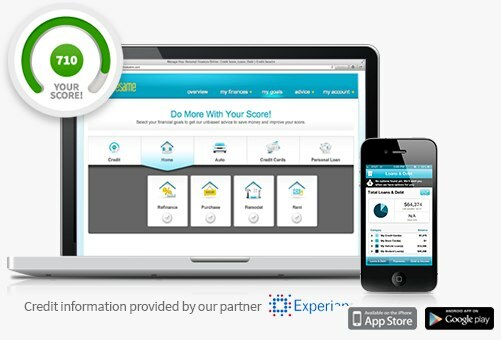 Sign up for a free account at Credit Sesame and start monitoring your credit report and score. With this valuable information, you’ll be able to successful raise your score and protect your credit from severe issues that may arise.